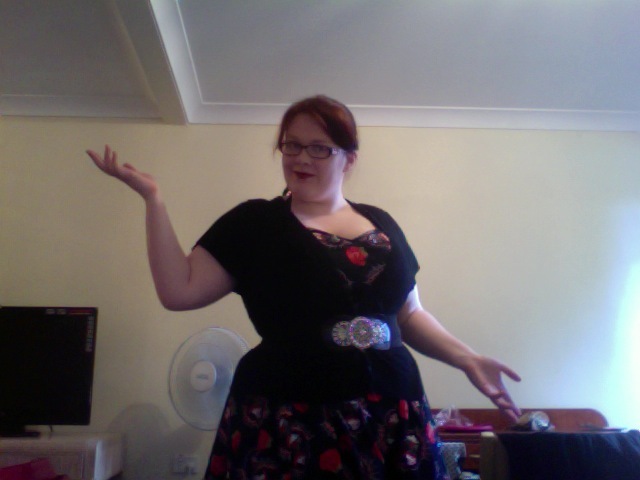 Potentially Problematic Opinions Month: I’m Fat. That’s Okay. Don’t mind me. I’m just being fat and fabulous. I am a fat woman. I have no qualms saying that this is who I am. While I’m not necessarily proud of it, I know it and I don’t need reminding. More importantly, despite the good intentions of many who do so, I don’t need to be chastised for it. I have tried plenty of diets in an attempt to shed weight, and some have been fantastic in the short term, but more often than not they leave me feeling sluggish, bloated, agitated, hungry and generally awful to be around. The weight-loss shakes might initially taste okay, but my tastebuds always end up catching up with them, revealing their true, artificial nature, no matter how much I’m told to cover it with servings of extra fruit, soy milk, extra ice or by using a blender. (Yes, apparently using a blender makes a difference to taste. No, that doesn’t make sense to me either.) The eating plan might be full of nutrients, but it quickly becomes difficult to stick to when you’re eating something starkly less appetising than the delicious, home-cooked meal the rest of your family are eating. The exercise plan hurts, and believe it or not, I have little to no tolerance for things that hurt, especially when the pain extends for days or weeks afterwards. I am fat. I have been for a very long time, and despite the holier-than-thou health-sermons people continue to throw at me (or at themselves in my presence, which is just as demoralising), I would rather accept it and enjoy my life in my current form than rob myself of simple pleasures in an attempt to change it. And according to researchers at Monash University, the University of Canberra and the University of New England, that is a perfectly good response. A recent study from the aforementioned scholarly institutions on the effects of the “Fatosphere”, a group of blogs about “fat acceptance” and what it means to be plus-sized, seems to indicate that acceptance of one’s shape and size actually results in individuals making better, more healthy lifestyle decisions. Despite arguments from some critics that these sorts of blogs, and the support groups that surround them, promote obesity and unhealthy lifestyles, the study indicates that this new culture is actually reducing dangerous behaviours like crash dieting, cycles of starvation and binge eating, and laxative abuse. From a personal standpoint, I completely understand where they’re coming from. I’ve seen it in my own life. In the ten months that I was at home with my family, I wasn’t going out very much, and the only people I was spending time with were folks to whom I was already very close. I didn’t have to worry about being judged for what I looked like, and was freshly armed with a collection of delightful (I would even go so far as to say life-changing, in their own way) plus-size dresses, so I wasn’t concerned about my body at all. Nobody around me was making remarks about their own weight, because we were all comfortable within ourselves. It was just cool all round. When I weighed myself in the morning (well, afternoon) before my shower, it was more out of curiosity than a need to see how much my weight had fluctuated. I was eating better (thanks to being fed good food by my family) and was eating less overall (because I was sleeping more, I wasn’t emotionally eating and had little to no junk food on hand). Slowly, I started making changes to the way I was living. Unlike the bracketed elements above, these were choices I took entirely off my own back because I wanted to. They weren’t about losing weight; they weren’t about the way I looked… Well, they were actually about my wondering if I would ever be able to be a companion to The Doctor if he ever turned up on my doorstep. (There’s a lot of running involved, okay?) These decisions weren’t based on any kind of external pressure, and they weren’t for any other reason than because I thought they might be fun. As the study linked above suggests, these healthy choices weren’t attached to changing the way I looked. They were about doing stuff I wanted to do. I made that decision not because I felt I had an obligation to do so, but because it just appealed to me. In fact, I’d even say that because there was no obligation, it actually made the choice more appealing. In the ten months that I was at home, I lost 13kg. It’s not hard to do the maths. Fast forward to my current situation: I’m working in the industry I love and writing commercials that make me really proud, but I’m also hanging around a lot more people who I’m still getting to know. Unlike back home, a lot of the people around me are very health conscious, which is really great for them. What’s not so good for me is the way that their vocalness on the subject feels almost pervasive. Every day, there’s a comment about what’s good and what’s bad food. As a result, I am once again becoming increasingly conscious of my body and the way I look. The fact that I have so many brilliant dresses means I have a sort of armour, but the talk of carbs and protein and blood type diets is still confronting. It makes me concerned that because they’re judging themselves, I am also being judged for what’s on my plate or how much blubber is on my frame. It makes me anxious, and that makes me reach for the chocolate bar(s), despite my best efforts to nibble on carrots and apples and other greenery through the day. I’ve become reluctant to go out and exercise because there are considerably more joggers and cyclists doing the rounds, and I inevitably end up making comparisons between them and myself. I walk to and from work most days, but that only really works because the stretch that I walk is pretty much deserted. My awareness levels in terms what I look like have shot through the roof. And in the last month, I’ve gained 3 kilograms. I’m more than willing to grant that this attitude could well be me trying to shirk off responsibility. I almost certainly need to address my weight in order to improve my health, but the fact remains that I am more responsible about my health when I don’t feel like I’m being coerced into it. Putting all that aside, there is still one other issue that I want to make perfectly clear: the only person’s health you need to be concerned about is your own. My fat doesn’t have any effect on anyone but me, and therefore whether I want your advice on diet or exercise is up to me. And to be perfectly frank, I don’t want it. You can keep that Potentially Problematic Opinion all to yourself. Potentially Problematic Opinions Month is a thing that runs all the way through August, and was initiated by the incredible Alexandra Neill of Adventures in TV-Land. This week, Lizzy has written about how Sansa Stark is amazing, and there are more to come! great post Noni! I'm going to link to it at the end of mine. Hey Noni, what a super post! Welcome to PPOM, I've linked to your post at the end of mine. And I love the way you write. This post brought tears to my eyes, and I really identify with some of the things you've said – I, too, have wondered whether I could keep up with the Doctor if he arrived to invite me to travel with him through time and space. Hmm, better go for a walk tomorrow morning! You never know, right? For what it's worth… there are quite a few people out there accepting of what you call your “weight problem” whether you are or not. At least you accept it, and love it. I honestly believe that people who are “fat”, know it, but don't let it bother them too much… are usually the best kind of people to be around. My girlfriend is a big woman, but her heart is bigger in my opinion. That's what I love about her. Like I said… for what it's worth.